Anita O'Day (1919 - 2006) was a truly great, original jazz singer who was perhaps more popular and respected in Japan than in her own country. 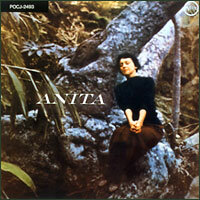 This Is Anita is the definitive, arguably the best record of O'Day. She is backed by a small combo plus strings arranged and conducted by the talented Buddy Bregman. The West Coast all-star rhythm section consisting of Paul Smith, Barney Kessel, Joe Mondragon and Alvin Stoller keeps the entire program swinging. In the bright opener "You Are the Top," O'Day changes the lyrics to drop the names of prominent jazz musicians. Her swinging "Honeysuckle Rose" is one of the definitive interpretations of this Fats Waller tune. Sensitive "A Nightingale Sant in Berkeley Square" is devastatingly beautiful. Recorded in December 1955. Originally released by Verve. This limited SHM-SACD was sourced from 2007 DSD masters produced by Verve (US). Mono.